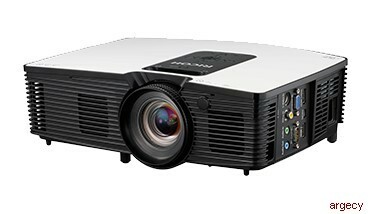 The Ricoh PJ HDC5420 projector is an affordable, entry-level, standalone projector that displays extremely accurate color and detail. Easily display movies and games in your home theater, show education videos at museums and science centers, or deliver presentations and videos at work. Ensure crystal clear projection of videos on DVDs and Blue-ray disks from the front to the back of the room. The PJ HDC5420 can project displays up to 300 inches diagonally with true high definition (up to 1920 x 1080 dpi) and HDMI connectivity. Make your information come alive with extraordinary precision. Maximize the color in videos and images with an enhanced six-segment RGBRGB color wheel that projects deeper, richer colors and lifelike natural skin tones. Project flawlessly on different surface colors and textures, in ambient lighting conditions and with various video formats. Project clear color and detail- even in brighter rooms. With 2,500-lumen brightness, a high contrast ratio of 9,000:1 and a widescreen 16:9 aspect ratio, you can easily view video and smaller print anywhere, anytime. Use less energy to get your point across with up to 6,000 hours of lamp life in Eco Mode. Need to change your audience or your venue? Simply grab this portable, non-networked projector and head to another room - and start projecting within five seconds of turning it on. Reduce IT involvement and replace dedicated mounted projectors and expensive projection screens with this portable technology. Get the true home theater experience at an affordable cost. Project full-sized 2D and 3D high-definition images on larger screens in your media or family rooms. You can even seamlessly stream movies and games from your tablets and mobile phones through an embedded Mobile High-Definition Link (MHL). 1Lamps are consumable products and therefore are not covered by the projector's warranty. The Ricoh PJ HDC5420 is under warranty against defects for a period of three years from the date of purchase. Consumables are under warranty for a period of 90 days from the date of purchase or until depleted, whichever comes first. Please refer to warranty documents shipped with the product for more details. For maximum performance and yield, we recommend using genuine Ricoh parts and consumables.